COSON honours Lai Mohammed – Royal Times of Nigeria. 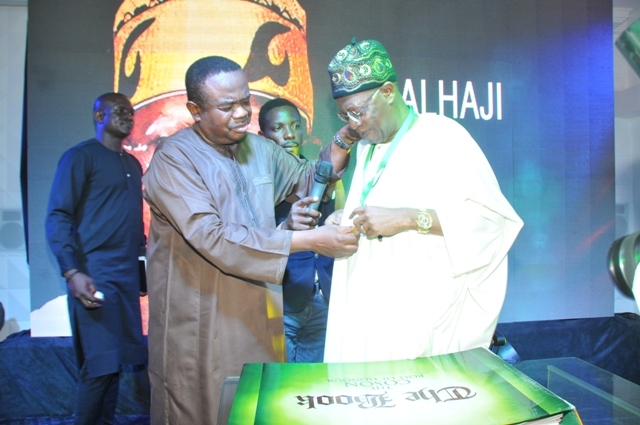 Copyright Society of Nigeria (COSON) rolled out the red carpet for Minister of Information and Culture, Alhaji Lai Mohammed at the weekend in Lagos. It was during the minister’s visit to COSON House. He was also honoured for his dedication to the campaign for the rights of creative people in the country. At a ceremony that featured plenty of music and documentary videos, the Minister was presented with the ”Copyright Medal of Honour” and his name entered in the ”COSON Roll of Honour” after the reading of his citation. COSON Chairman Tony Okoroji, who made the presentation that rounded off the hour long ceremony, described the Minister as a ”unassailable and fearless public servant”, and thanked him for being the first Minister to visit the imposing green-and-white COSON House since it was commissioned. The Minister was accompanied on the visit by the heads of relevant parastatals in the Ministry, including the Directors-General of the NTA (Yakubu Ibn Mohammed), FRCN (Mansur Liman), NTDC (Folorunso Coker) and the Executive Director of the Nigerian Film and Video Censors Board (Adedayo Thomas).